I reckon that what markets did on this opening day of 2016 gives us a taste of what we’ll see all year: stocks hammered, dollar rising, SILVER and GOLD PRICES unfazed and pushing up. On Comex today the GOLD PRICE jumped up $14.80 or 1.4% to $1,075.10. Silver inched up 4.2¢ to $13.817. Have to view the 5-day charts to grasp what today means. The price of gold simply gapped plumb straight up from $1,060+ to $1,080. Silver gapped from $13.87 to $14.05. 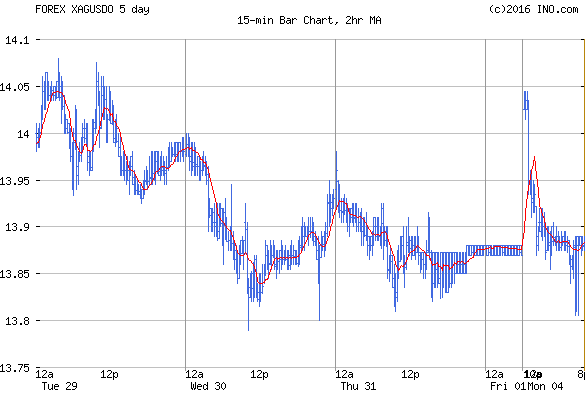 Now as the day wore on the gold price gave back $5 – $7 of that gain, but still finished at $1,075.10. $1,080 has been formidable resistance for some time, although $1,088 will be tougher. Point is, gold price jumped right up to toe the starting line. Another day of stock market arterial bleeding and gold will easily push through that, Nice Government Men notwithstanding. Speaking of Nice Government Men, were I they I would hit the thinner precious metals markets — silver, platinum, palladium — where I could get more bang for my manipulating dollar. Whoops, platinum dropped 8.50 today and palladium 17.85. Ditto something big like a city bus hit silver, knocking it back from a $14.19 high to a $13.817 close. I don’t like what that did to the ratio, pushing it up to 77.810, but the ratio remains in a downtrend from its December and August highs. No real damage done yet. Where are we left? The gold price closed above its 20 DMA and is trudging toward that $1,088 resistance, where now also the 50 DMA lieth in wait. Our signal to buy is any breakout over $1,088. Silver labored mightily, but brought forth a mouse. Nothing happens until it closes over $14.40. Now I say I am convinced the lows are behind us, but I know that takes me out on a limb. Well, hand me the saw ’cause here I am. I was waiting for the do-nothin’, say-nothin’ thin market holiday weeks to pass so we’d get some idea what metals and stocks intended. Today they showed all the cards in their hands. Most spectacularly portentous is the price of gold rising 1.4% on a safe haven bid while the US dollar rose only 0.18%. 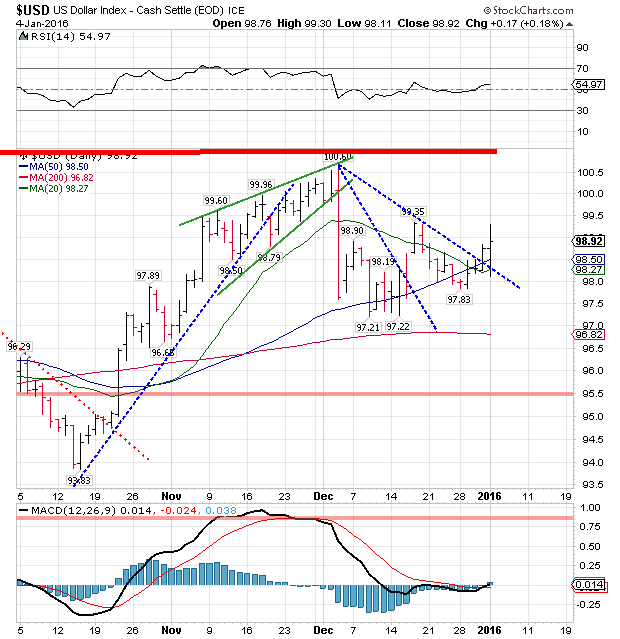 Appears 2016 will be the year of silver and gold prices. If I were y’all, I’d be selling them stocks like the Russians were on Main Street. But what do I know, durned ol’ nat’ral born fool from Tennessee? Why, I don’t even own a Beemer or a Mercedes, just a danged ol’ 1994 Isuzu trooper with the paint job going gray. Course, I don’t owe nothin’ on it, either. Starting off the year was a 7% panic drop on the Shanghai exchange, which broadcast panic around the globe. German Dax dropped 4.28%, French CAC lost 2.47%, the FTSE tumbled 2.39%, Dow Jones World index fell 2.01%. 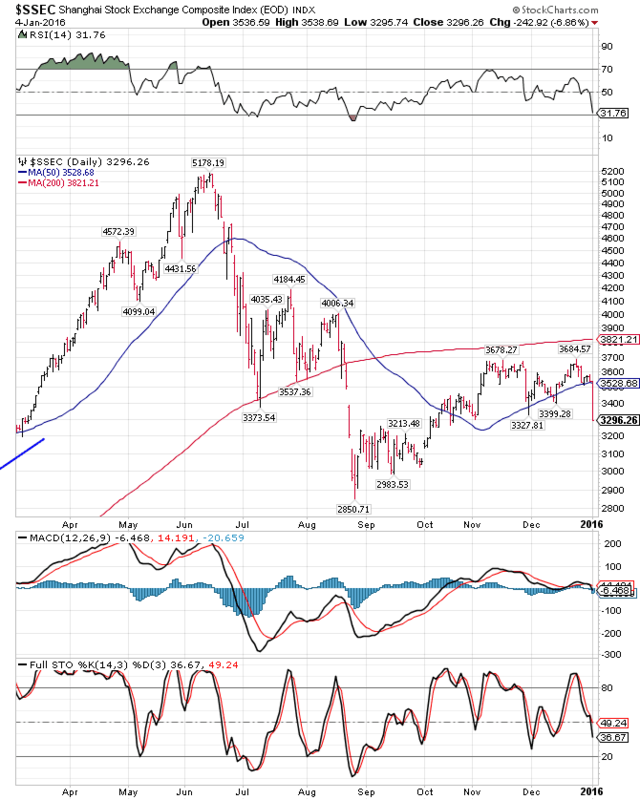 Here’s the SSEC, so y’all can see what a 7% drop looks like – chart on the right. Pay no attention to the geniuses who will discount this drop by claiming it was only spurred by bad economic data for December. That’s just the point, all that “bad economic data” is ALREADY working in the Chinese economy and the US, and that stock market drop awaited only a catalyst. Time the sun got round to New York, panic was already there. 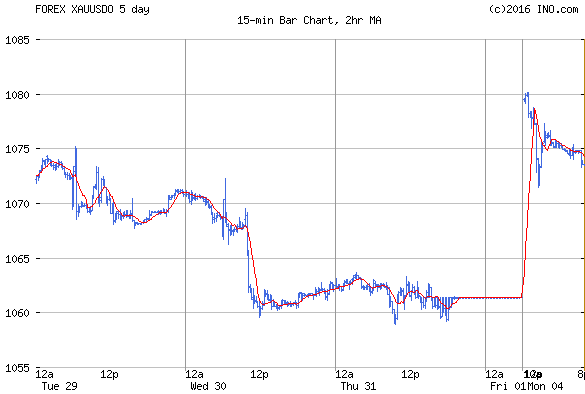 Dow dropped like an anvil pushed out of a 747 Jumbo Jet, straight down, and by 11:00 was off 476.4 points or 2.7%. “Friends” came in to buy toward the close to keep it from closing below 17,000 — bad for morale. Dow closed 371.76 (2.13%) lower at 17,053.27. S&P500 kept up, paying back 41.81 or 2.05% for a 2,002.13 close If the Dow hadn’t found “friends”, it was heading for the worst first day of the year close since 1932. Great job, Nice Government Men! Looking sharp! One more thing: today’s drop took both indices down to the lip of that upside-down bowl topping formation, setting them up to slide hard tomorrow. I, of course, never gloat, because gloating is bad for your skin and makes you liable to choke on your own pride. Wherefore, ‘stead of gloating I merely note in passing that the Dow in Gold and Dow in Silver fulfilled my expectation and turned further down, confirming that the highs are behind us and that stocks have turned down against metals after a 4-1/2 year correction. Well, I might be a MITE previous, but here’s what happened. Dow in gold dropped 2.81% to close at 15.97, below both the 20 and 50 day moving averages, and right on the line that formerly bounded the top. It should fall pierce that line tomorrow, having left behind double tops (red arrows). 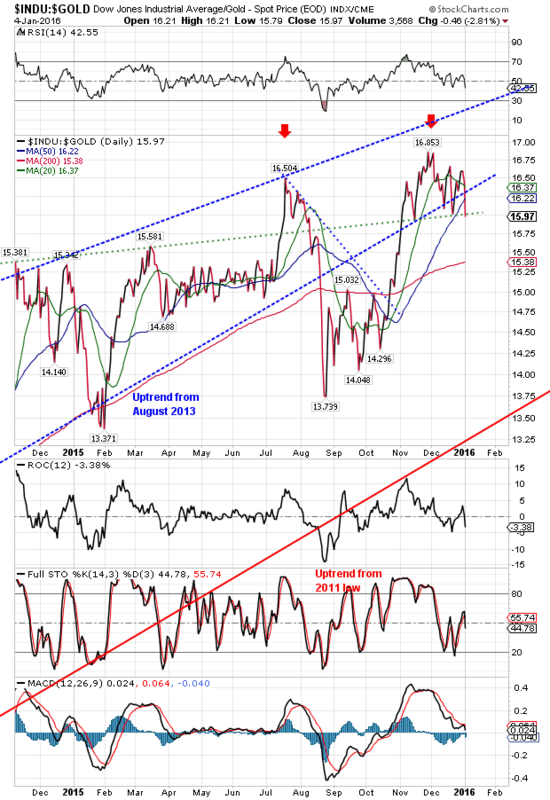 Durn, I forgot to mention that it also closed beneath the uptrend line from August 2013. Dow in silver rolleth also over earthward. 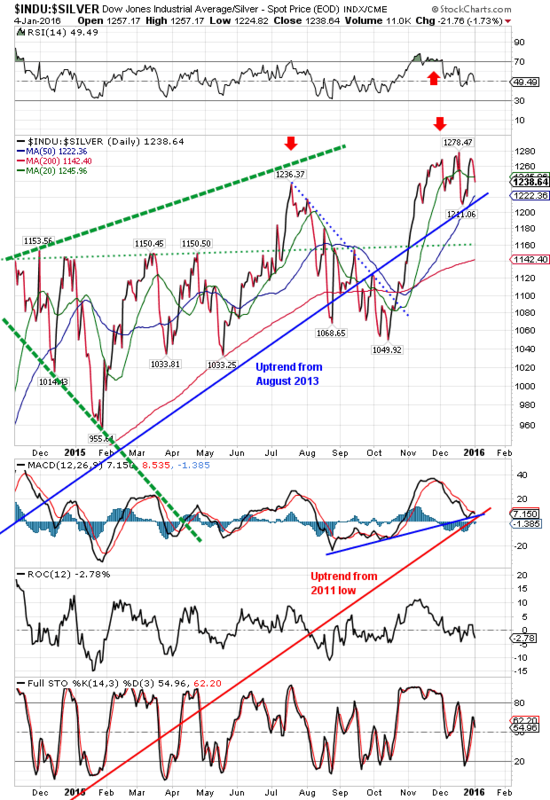 Closed today below its 20 DMA, having also left behind double tops in August and December. Y’all don’t take my word for it, chart on the left. Yen gapped up and ended 0.78% higher on the day at 83.77, profiting from a safe haven bid. There was lots of panicked money loose looking for a nest, too. Euro did what it does best, sank. Dropped 0.25% out of its 7 month trading range, again, as it did in November, and closed at $1.0832. Meanwhile the US dollar rose 17 basis points (0.18%) to 98.92. What most attracts my eyes and mind is that in spite of that and all that affrighted money seeking a safe home, the US dollar rose only 0.18% while gold rose 1.4%. Which currency won the safe haven bid? That close is the scurvy US dollar index’ second day close above the downtrend line and the intertwined 20/50 DMAs. 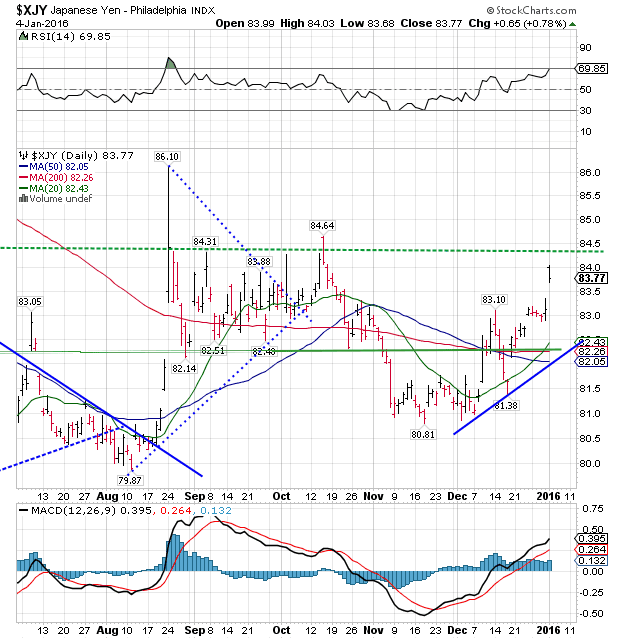 Dollar thus will move higher, but remember that brick wall of resistance overhead at 100.70. Behold the chart on the left.